THE Court of Arbitration for Sport has reinforced Fiji's ban from the 2010 New Delhi Commonwealth Games in October after dismissing its appeal. The CAS ruling against the Fiji Association of Sports and National Olympic Committee was announced on Thursday. The Commonwealth Games Federation banned Fiji when its membership in the Common-wealth was suspended. FASANOC president, Vidya Lakhan, says he has only been told that the appeal has been turned down, not the reasons why. "We can't seem to understand how the decision could have gone against us because the Commonwealth Games Federation constitution says if your country is in the Commonwealth, then your athletes can take part," Lakhan told Radio New Zealand. "That was the basis of our appeal, to CAS. We're very much interested in finding out the grounds on which our appeal has been dismissed." Fiji first entered the Commonwealth in 1970 and were re-admitted in 1997 after a ten-year lapse. After making a surprise debut at the 1938 Empire Games in London, Fiji returned in 1950 to win 1 gold, 2 silver and 2 bronze medals. Missing only in the 1990 Games Fiji continues to provide tough competitors and proudly lifted silver in the inaugural Rugby 7s in 1998, again in 2002 and the bronze in Melbourne in 2006. 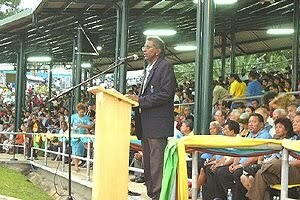 FASANOC is responsible for organising Fiji's participation in the South Pacific Games, Commonwealth Games and Olympic Games. They successfully hosted the 2003 South Pacific Games in Suva with 20 nations taking part in 34 sports. Fiji has always surprised the world of sport with its population of outstanding athletic talent and enthusiasm for sport. In the early days it was athletics but more recently with gold and bronze in Manchester, its Judo athletes have surprised many while its rugby sevens team continues to entertain and amaze. Something definately wrong with this man - Vidya Lakhan? Wants verification of reality suggest he checks Fiji Sun & Times for news of Fiji's disqualification? Instead of trying to blame others -suggest he goes to the root cause? (dictator & associates). You have been doing a lot of dribbling down your chin! Perhaps you backed the wrong horse in supporting the coup?? Like the sugar industry....you are totally farked!! !